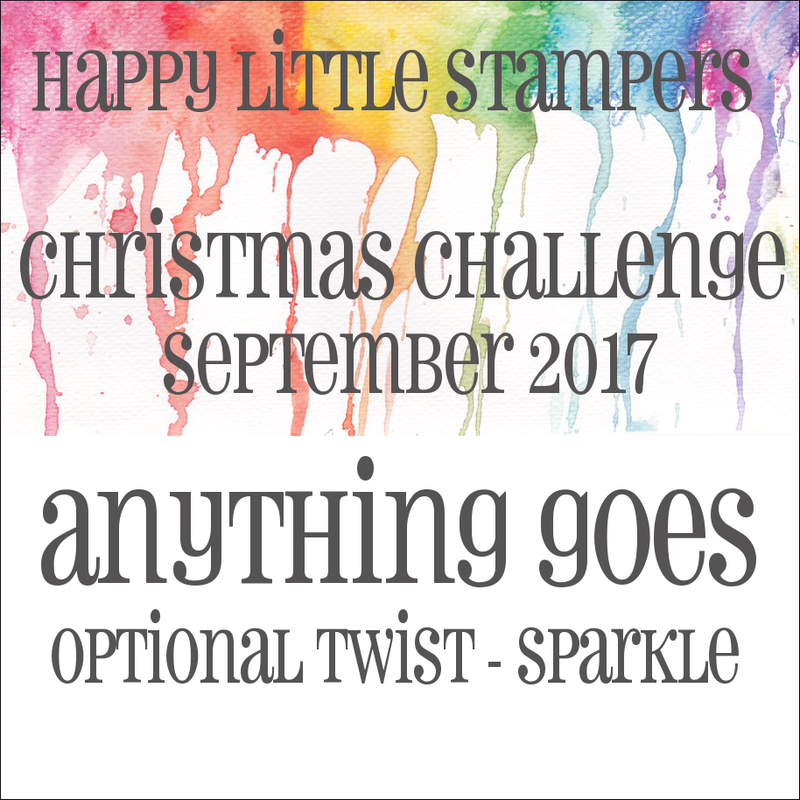 There are awesome Christmas card challenges in Blogland that are springing into action now that September is here. One of my favorites is Merry Monday, back from summer break. 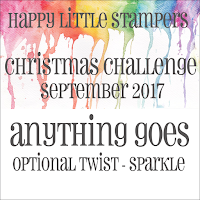 I'm also entering Happy Little Stampers September Christmas Challenge where the brief is "Anything Goes" with the option of "Sparkle," and Simon Says Stamp Wednesday Challenge where we are to "Stamp It." Double D Challenges: Glitter, glitter, glitter. Simon Says Stamp Monday Challenge. Stamp it. Both sediments are from Hero Arts. In truth, I made a few cards like this last year and never got around to sharing them with you so I made a few more for this year in nontraditional Christmas colors. I know they are uber clean and simple, but I hope the texture from the linen paper and the schparkle from the glitter paper keeps them from being too meh blandino. I have some pops of color from the yard to share with you. With triple digit temperatures this summer, these plants are our only garden color right now, but they light up the whole place. I have lost the tags with the name of these blooming grasses, but Mrs. Google calls them Monkey Grass, Mondo Grass, or Big Blue Lily Turf ...? Do you know the correct name? Two simply fabulous cards ... love the design and the sparkle. Sorry but I can't help with the name of your plant but do love the splash of colour. Fab CAS cards Darnell, love the textured card and sentiment fonts are lovely. I love these CAS cards Darnell and the textured card that you've used for them too. I have arrived at your blog via Mrs Duck's. I love the simplicity of your cards today. I think your plant is Liriope Muscari - we have a darker leaved version in our garden but they are not flowering. I might copy your idea of putting them in a pot. Darnell, you know this is a KISS card, right? Keep it Simple It Simply Sweet!! And you did it! Love the card and love that you are playing along with us at Merry Monday!! So good to see you in the gallery!! Wonderful QACAS cards Darnell - love the sparkly stars and the linen texture showing under the stamping. Lots of pretty sparkle-y goodness on your stars...and easy mailers, too..love that! Thank you for joining our challenge at Double D! love those flowers! very beautiful! Great Christmas CAS cards, dear Darnell. I like the sparkling stars. it looks like the variegated liriope. Very pretty. Look that up. Beautiful cards! Love the sparkle. I love Christmas cards with sparkle. The sentiments are very pretty. I don't know the name of the plant, but my grandmother used to have this in her garden. I like the classic look of clean and simple cards and these are so pleasing to the eye. That sparkle is captured so well in the pictures. I don't know the name of the grasses but that hanging pot is gorgeous. How lucky you have that as a scene from your window. It's amazing that anything is still blooming in the heat you're having. Hope you are keeping cool. These are FABULOUS Darnell and I LOVE that sparkly blue star! Perfect! Thanks so much for joining in the fun at our Double D ‘GLITTER’ challenge! We hope you’ll come back often. such a very brilliant cards and their designs are so clean and wonderfully created as usual. If I was given a line up of cards and told to look for yours I would always be able to tell yours from anyones elses as your designs are always so clean and very lovely. Great CAS cards. The plants look like a variegated form of liriope (aka Lily Turf). Wish I did know the name of the plants...love that basket. Was admiring your green thumb when I was there. This one's gorgeous. As are you CAS cards. 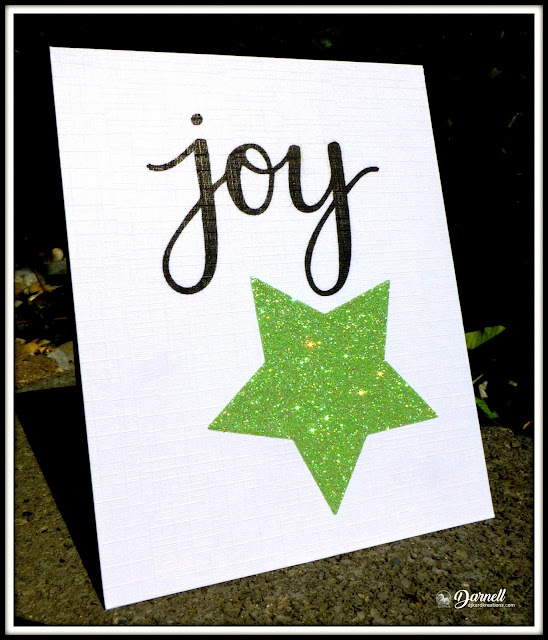 The glitter, of course, is pretty but, to me, the real stars are the rich linen paper and the luscious font on the "Joy". Love and own this stamp, too. Have fun your trip. Beautiful cards for Christmas, Darnell, I love the sparkly stars, and the fonts on the sentiments! Thanks for playing along with us at the Simon Says Stamp Wednesday challenge! Now that's the way to go in order to get the Christmas cards done! Pretty and simple with fabulous sparkle and color. I love them! I think I've seen that plant called Lily Turf. I have some Black Mondo Grass, but it's small like a ground cover size. Very black, though. Amazing stuff. Dang, I forgot to tell you how awesome it is to see your card in our Glitter challenge at Double D! Love the texture of the papers and the sparkling stars! Fab both your CAS! Hi Darnell, Loving the sparkly star cards. Wow--what a gorgeous plant & one that can take triple digits, too! My hanging plant actually survived the heat, but not the darn cut worms! Love your perfectly CAS design, Darnell--not at all boring! The linen card is wonderful & so are the non-traditional colors! PS--we got a sprinkle this morning & the smoke is less, so it's a good day! I love your cards and especially the textured cardstock you use; please share the information about it and your source sometime in your blog. ... Liriope is your pretty plant, as others have said, and it definitely has a bazillion other names, too. So beautiful are your cards Darnell as always too your plants are stunning too!! Lovely big sentiments and schparkly stars! Love that textured paper! The plant looks like what we call Monkey grass except that it isn't that big. It's hard to kill. I dug some up and stuck it under a tree intending to throw it away. It never did die, so I left it. It's tough, and I love those sweet purple flowers that look like little lights in the plant. Always a Joy to visit your blog Darnell. Love the sparkly stars and the CAS designs. No idea on the plants soz. Both cards may be simple but they are amazing, I love how the star twinkles on the second card! Fantastic sparkly stars on your cards. Love those colors too. And, your pretty plants are so fresh and healthy looking. I have no idea what they are called though. Fabulous sparkly card and enjoyed your plant pictures. Just love your sparkly star cards, Darnell - perfect with those sentiment diecuts!! Love those sparklie cards and the plant pics. Surprising that anything still grows in that heat. perfect as are the colors. These cards are incredible! I am NOT very good at keeping things clean or simple, so I always have a huge amount of respect for those that nail it and you nailed it! I love how these have some sass and flair and shimmer, yet they are simple enough to be reproduced on a large scale. This is an impressive blend of a stunning card that is also do-able to make. Thank you so much for sharing these inspiring cards with us for this week's Simon Says Stamp Monday Challenge! Love these beautiful cards, Darnell. The colors and fonts are perfect. How lovely! I always admire people who come up with simple designs and make me go "WOW"... You are one of those people! Fabulous cards and I hope you enjoyed your break? Gorgeous CAS cards Darnell! Beautiful blooms too! Oooh la la...your shimmery stars Christmas cards make me feel all merry and joyful! So pretty! *Someone* hasn't made even on Christmas card yet and yes, panic is sure to ensue, come November, as per usual! You'd think I'd learn! Your plants: soooooo pretty! No ideas as to names, but I rather like Big Blue Lily Turf (sounds like a racehorse name *grin*). Gorgeous sparkly stars! Love theses two beauties. Thanks for playing at HLS Christmas challenge. Your plants are varieties of Loriope. :) I grow them in the ground here in Texas. I really love your CAS card! You are right that the card texture and the wonderful sparkle keep the card from looking anything but plain! So pretty!!!!! What a cute CAS Christmas card and great take on the sketch. 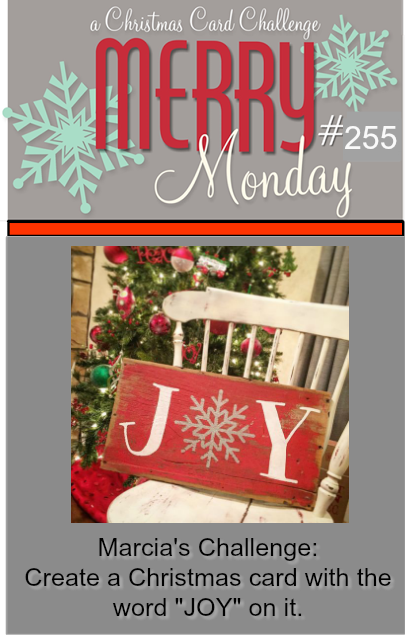 Thank you for joining us this week over at Merry Monday. CAS at it's finest! I love those BIG bold beautiful stars and JOY just happens to be my most favorite word! You were also able to capture that fabulous sparkle on both of your cards, not an easy task when photographing! Well done! 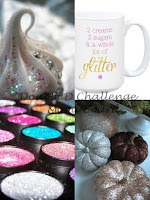 Thanks so much for playing along with us at The Double D, Glitter Challenge, Donna, DT Member. I love CAS with Sparkle. Perfect for Christmas and mass producing. And I love that linen paper too. I have a whole bunch of it and never think to use it. I'm getting it out right now. 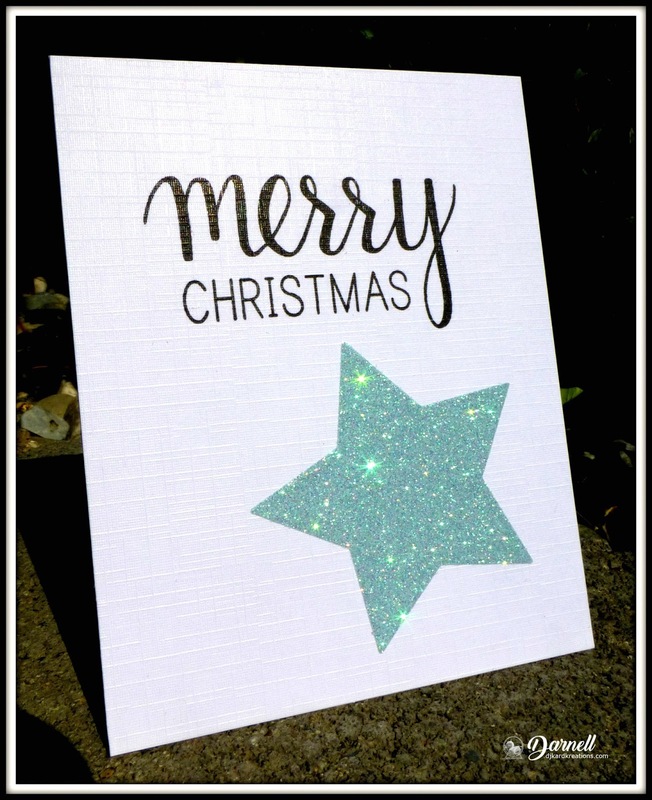 Glitter and stars, a match made in Darnell's crafty corner! Thanks for letting me know about Merry Monday's challenge beginning again. Love the glitter stars and it works for a birthday or Christmas. One can do so much with just the saying and the glitter. I love your flowers and they look healthy. The names you have them works for me. Fabulous cards, although I have to confess that I read the last sentiment as Messy Christmas, well it fits my Christmas preparation anyway! Two beautiful CAS cards, Darnell. Bright, fun Christmas cards. Love the sparkle. My plants are fading fast, too. Thanks for sharing your pics. Gorgeous cards Darnell! LOVING that sparkle! Thanks for playing along with us at Merry Monday. Boy, can you see that sparkle. I'm not normally a glitter gal but that could change lol! Beautiful plants but don't think we get anything so exotic here. I love these big sentiments. They allow you to utilize a substantial part of the card without creating a mess on the card. Glittering stars shine brightly, it's even visible on your photo. Great CAS Cards! You have quite a jump on Christmas cards, but then I know you make oodles of them. Ready for your challenge so that I can make some new cards. Summer with the boys does not make for productive card making. Not complaining I am blessed.